After your ISPConfig installation is finished, log in. Then go to Managment and in the left frame under Server choose the sub-menu Settings. 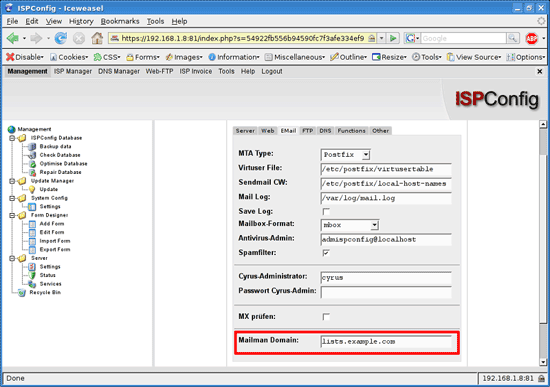 In the main frame choose EMail and set the Mailman Domain as shown in the screenshot below. All the mails for this domain will be handled by Mailman. So you should use a dedicated domain, list.mydomain.com is a good choice. This is already the end of this mini howto. Where may I download the version 2.3.3+ ?? 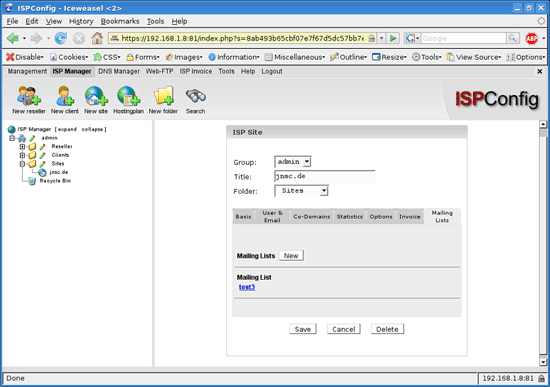 I've installed the svn version wich is 2.3.3 but it doesn't ask me if I want to configure ispconfig with mailman support, neither in the expert nor in the simple configuration methods. Also, I'd like to know how to configure mailman to work with ispconfig, since I can't find the way for this.